We went up in to the mountains for a day too. They’re so visible from everywhere, so it was great to actually get up and out of the urban area and into some nature. 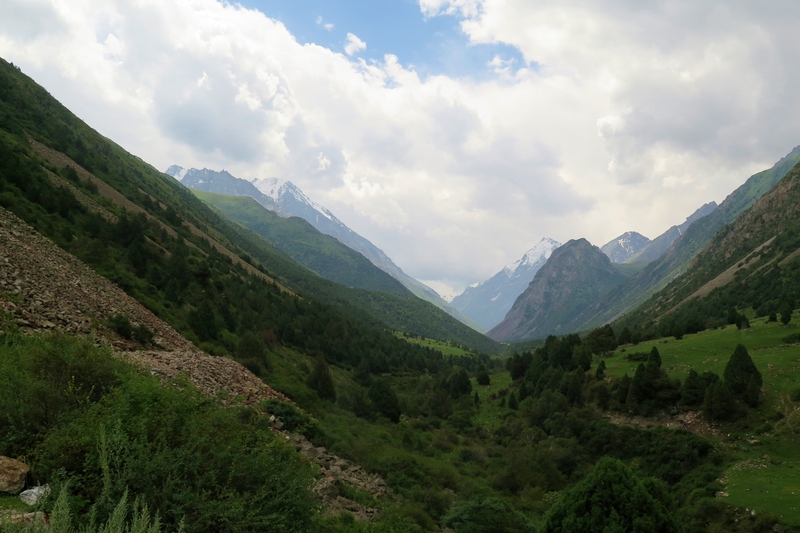 We took a taxi up to Koy Tash and went for a hike up the valley. We crossed a river on a very sketchy ‘bridge’ and then followed it up towards the peaks to the south. Even though we weren’t up there for long and a big thunderstorm rolled in around us, it was some much needed exercise, and a distraction from the hanging around. Then, one day when we knocked on the door of the embassy, we were told, yes, the visa had arrived! All three visas we needed were in our passports and we were ready to roll. Except, we decided to stay around for a few more days. 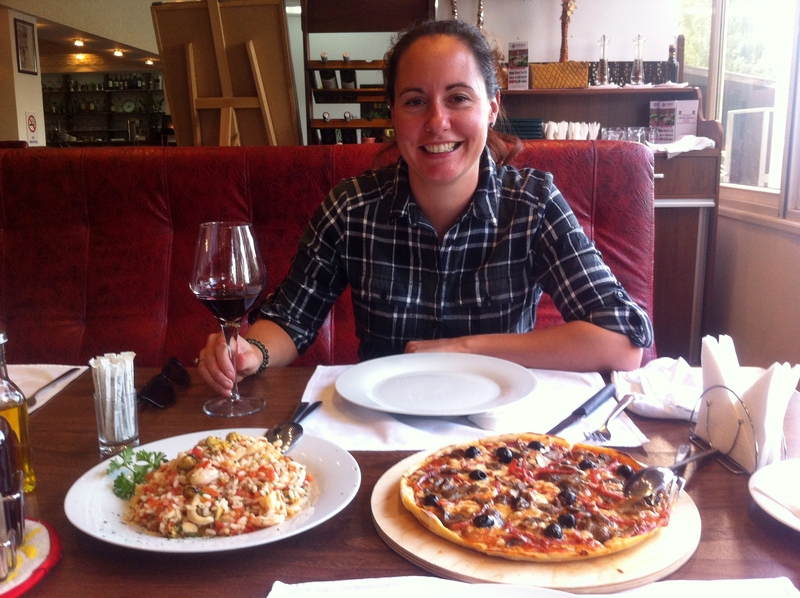 My birthday was the following day, so we arranged to go out for some dinner and a few beers with JK and Will to celebrate the visas, and me reaching 35 years of age. On paper, the first day was an easy one. 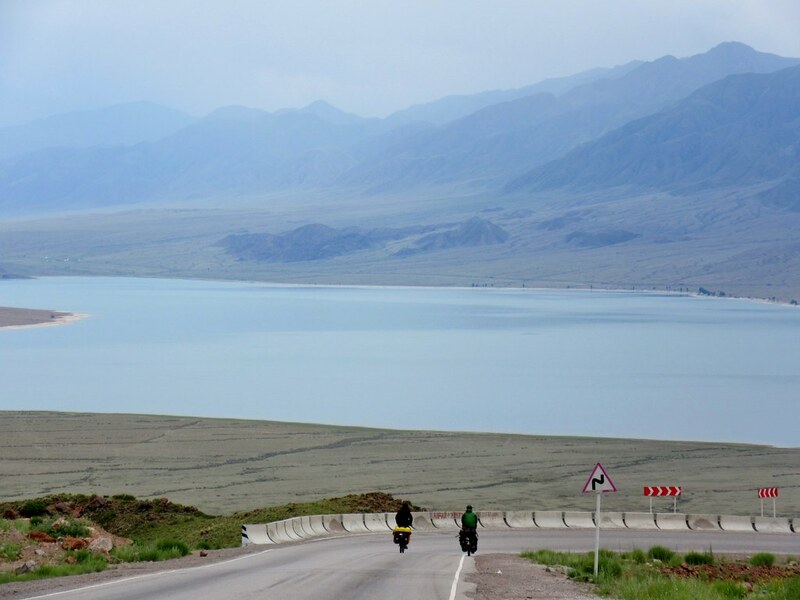 A flat 65km to Tokmok, the next sizeable town to the East. 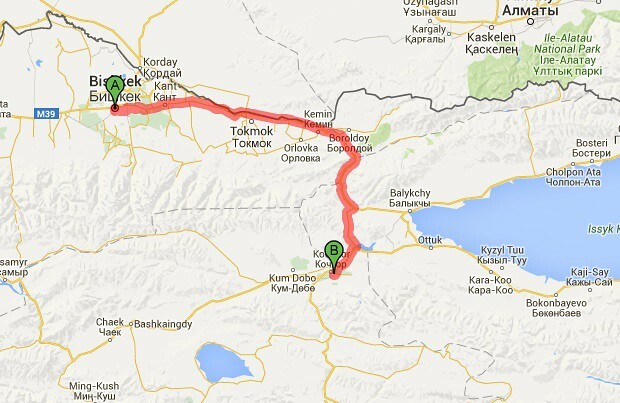 But the crap roads leaving the city and our ‘very well rested’ legs made it was a lot tougher than expected. The traffic was heavy initially, so we were careful to keep to the side of the road. But the surface was very broken up and potholed so it wasn’t comfortable riding. Nothing really interesting about the riding, other than we got more and more waves and ‘hellos’ the further from the city we got. A nice bit of encouragement when neither of us were really loving it. 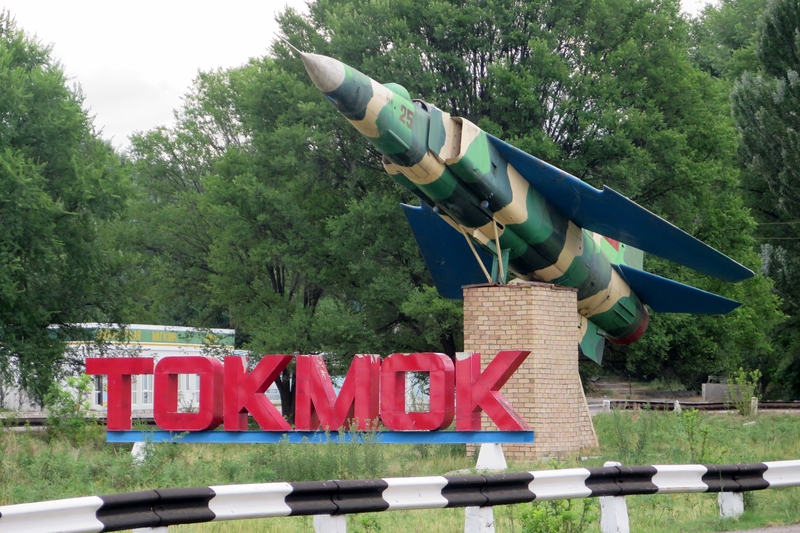 We were able to keep a decent pace though, and got into Tokmok by mid afternoon, riding past a Mig 23 fighter on a pole, welcoming us to the town. Wikipedia (and another cycling blog) tells us that Tokmok’s other claim to fame is that it’s the home of the Tsarnaev brothers, aka the Boston Marathon bombers. 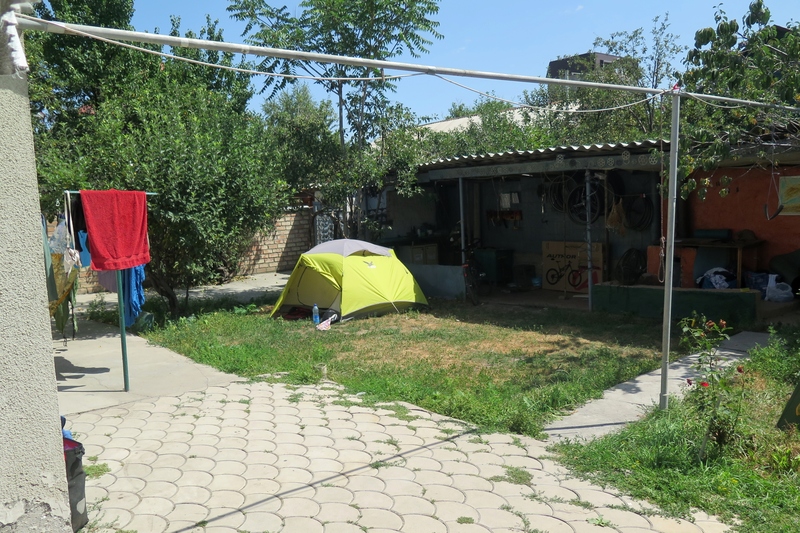 Once we got into town we found a guest house and saw Nam, a Korean guy who we’d met back at AT House in Bishkek. 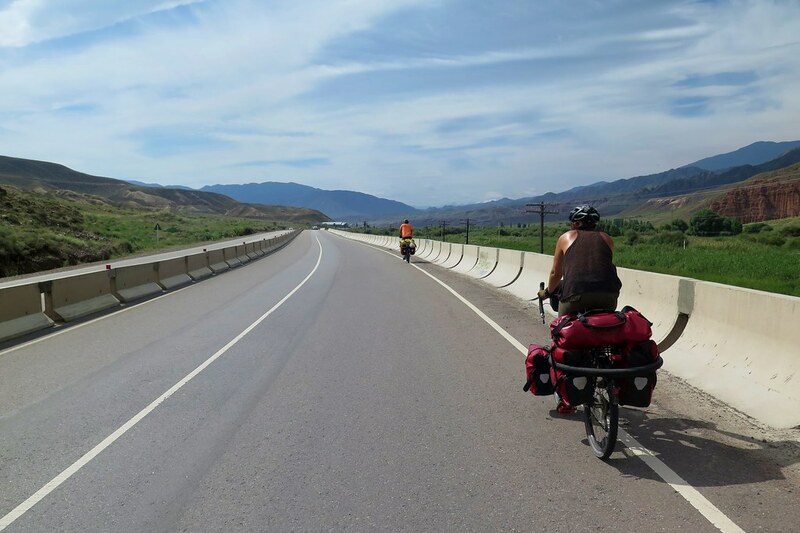 He started riding from Germany in May and is making very quick progress towards Korea. We had dinner together and decided to ride together the next day. A hot and mosquito interrupted sleep, then a slow start to the morning. Our body clocks are yet to get back into cyclist mode (early to bed, early to rise.) 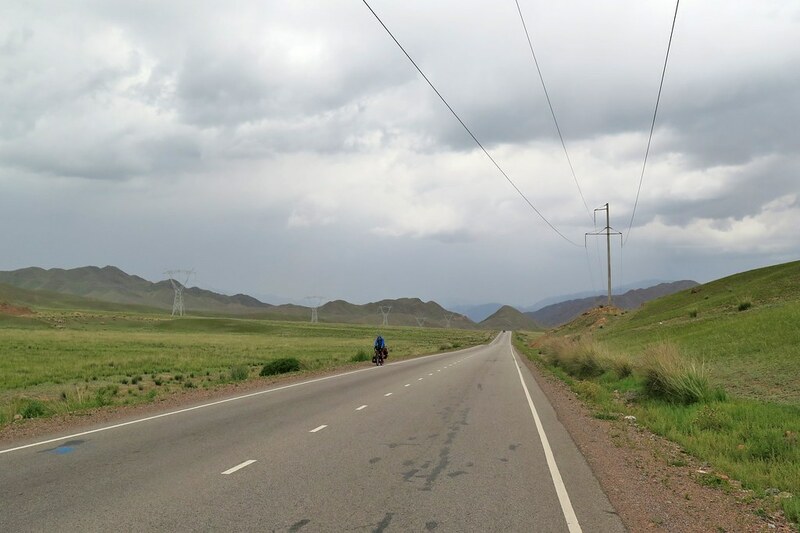 We were back onto the main road riding as a 3 towards Issyk Kul, with a nice tailwind to help us along. 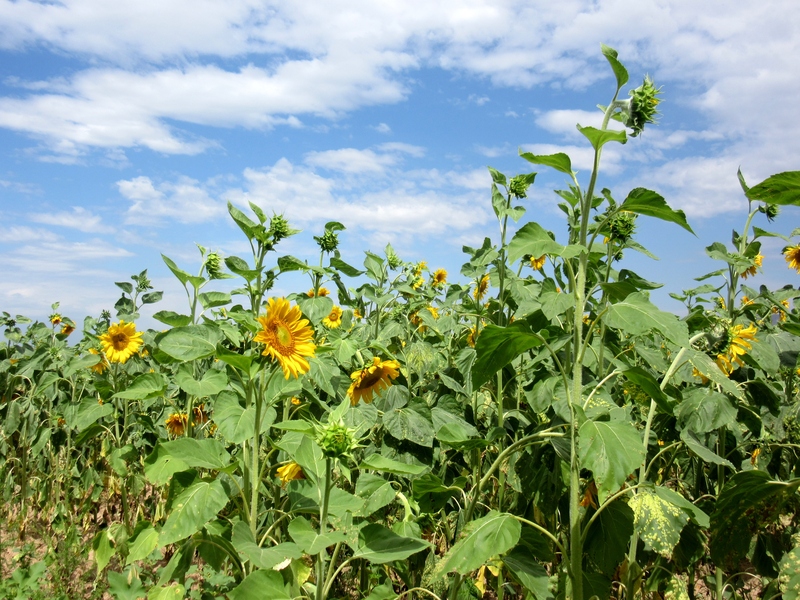 The road was lined with sunflowers and gradually climbing through the morning. The tailwind compensated for it, giving us a little bit of ‘free’ altitude. 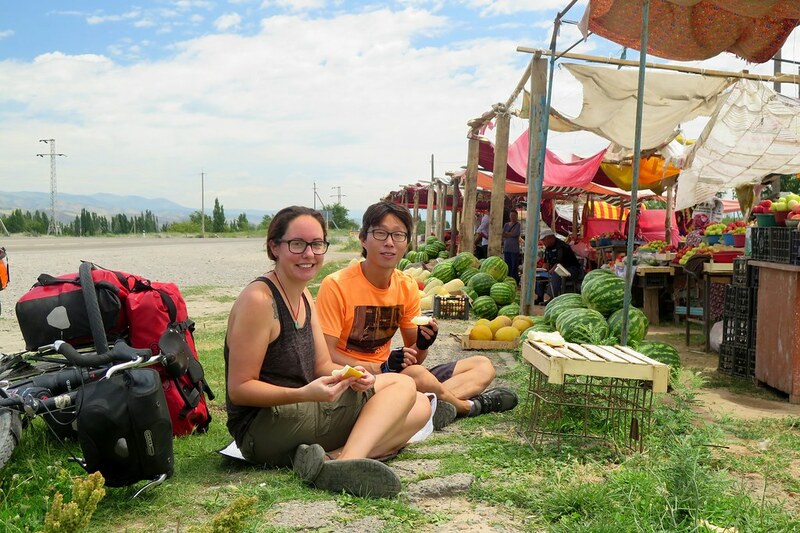 We stopped at a fruit stand to pick up a few apples and a melon to eat there and then while we had a short break. 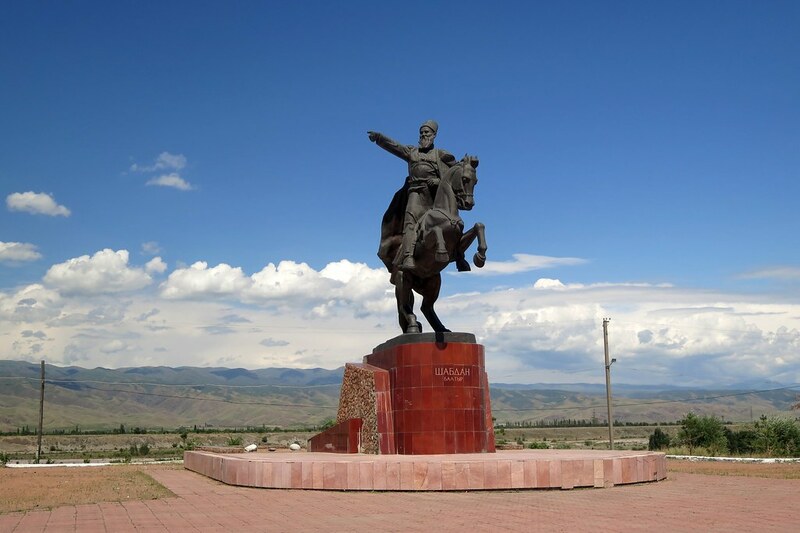 We continued on to Kemin, where both of us started to feel very low on energy and a bit shaky. Definitely feeling the lack of fitness at times, but a good bowl of lagman noodles (seemingly the only thing available in most roadside cafes) and a long rest had us feeling better and ready for the afternoon. 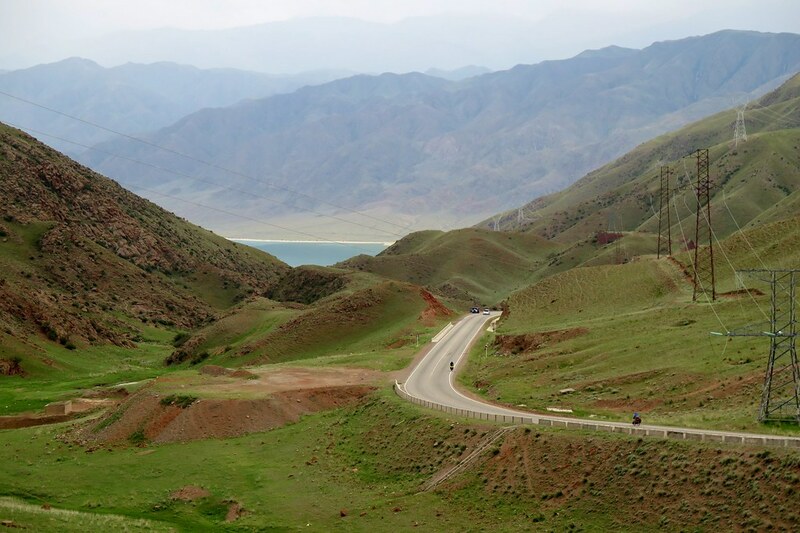 We took a side road which started to climb more steeply as it turned south towards a small gorge through the mountains. 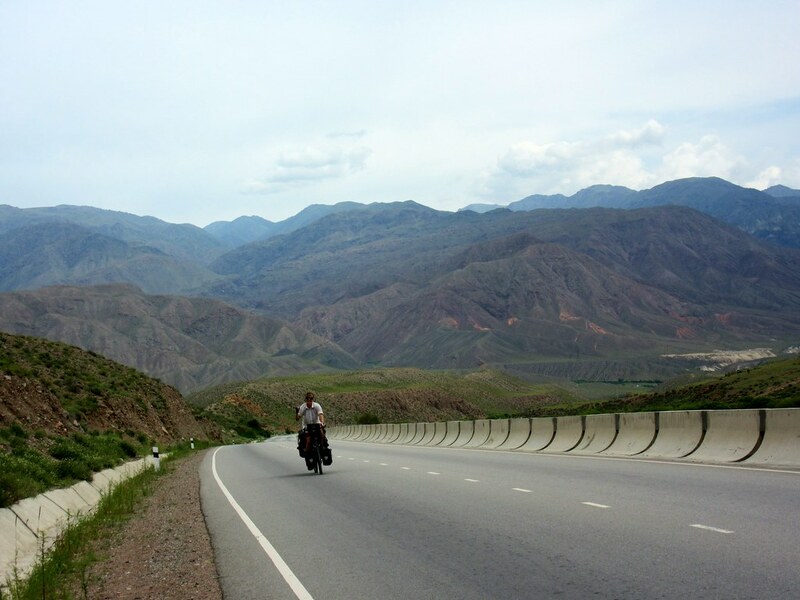 The traffic was very quiet and the mountains around us looked spectacular against the vivid blue sky. We pulled in for another drink stop later in the afternoon, sitting for a while chatting to a woman who was an English teacher at the local school. She was really friendly and her young kids already spoke pretty good English. We climbed further into the gorge, rejoining the main road, and started to look for somewhere to camp. On one side we had a railway line then a steep rocky mountainside and on the other, a fast flowing river. 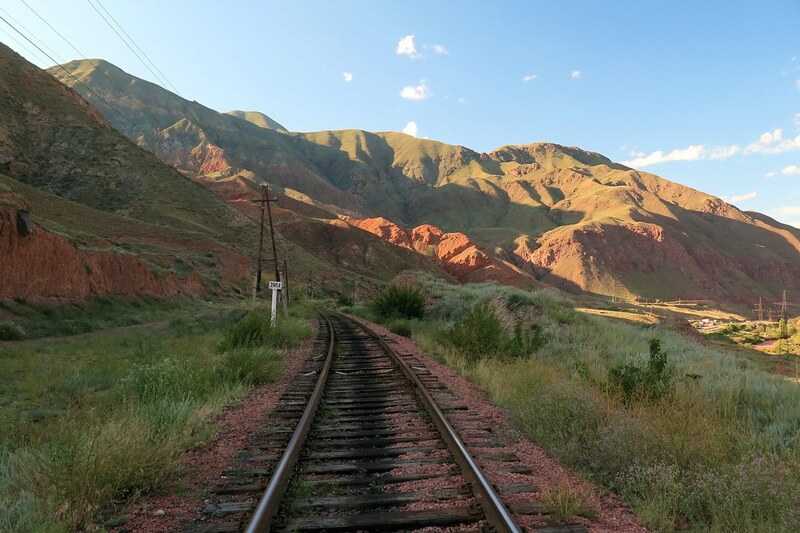 At about 1,400 metres there was a small dirt road which spurred off to the right over the railway line, which we took to look for a camp spot. We saw a sheltered flat area, invisible from the road but next to the railway line. 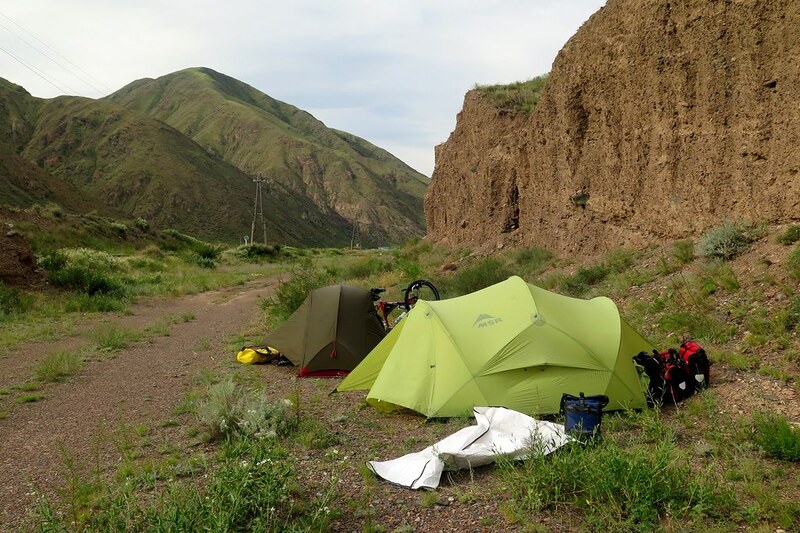 We hadn’t seen a single train all day so we pitched our tents there and cooked up some dinner. 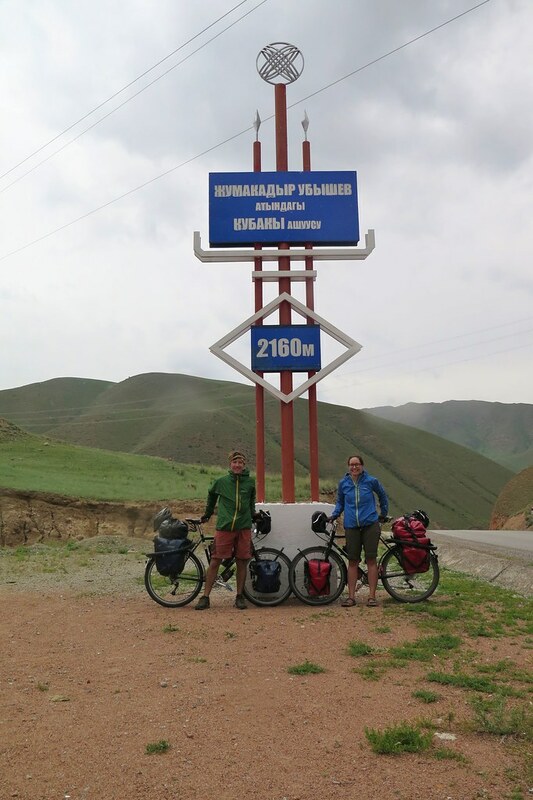 It had been a tougher day with the climbing in the afternoon, but we were feeling much better at the end of it, remembering the enjoyment and satisfaction to be had from riding a bike and camping out. There were a few spots of rain in the night, the clouds roll through these mountains quickly, changing the weather. The wind picked up too, giving us a headwind to face the next morning. We cooked up some oats for brekkie with some of the apples we bought the previous day. Then we set off to continue up the gorge. 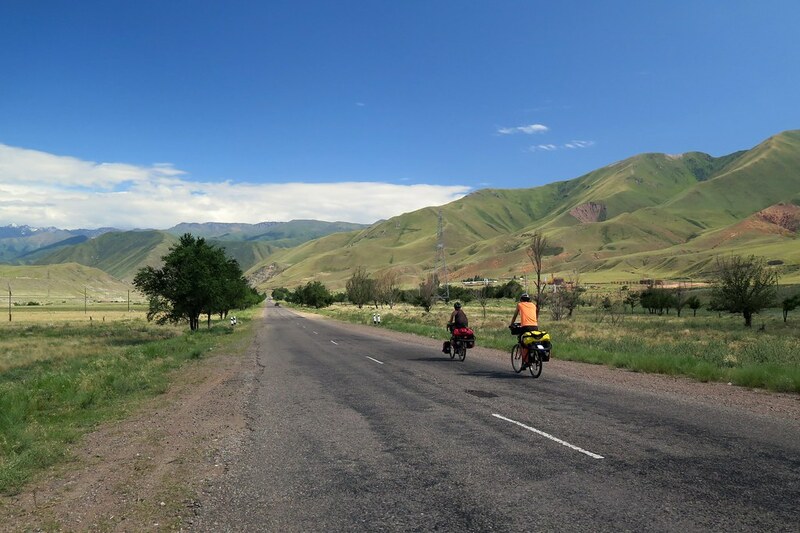 Initially the weather was clear and the road surprisingly flat, giving us a really pleasant start, despite the headwind. We started to get some views to the peaks further in the distance, snowcapped and towering above the lowly 3-4,000 metre ‘foothills’ around us. 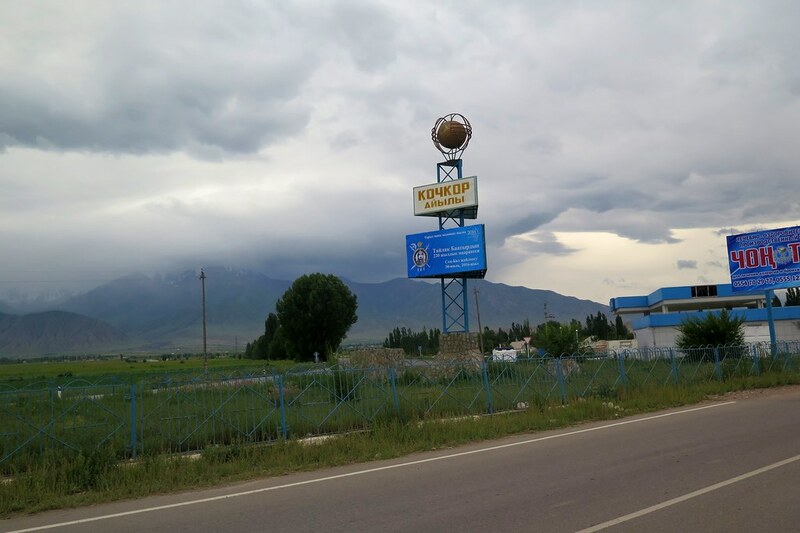 At 30km we turned off the main road. 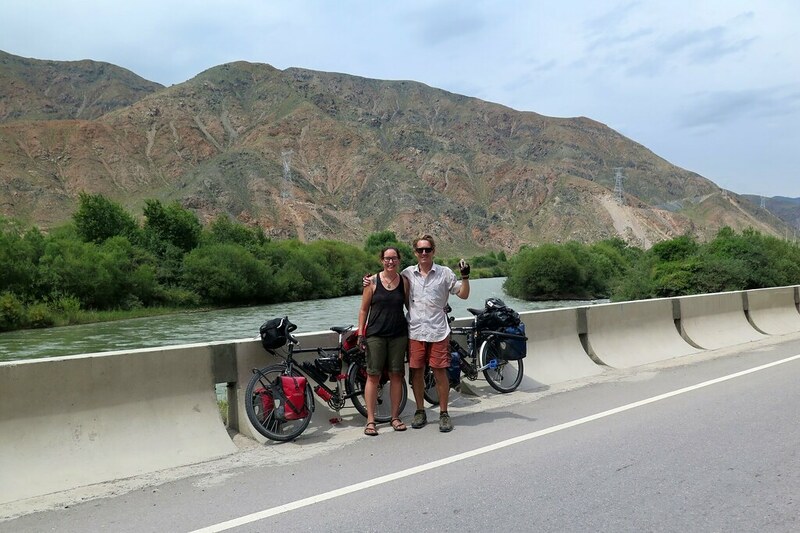 We had hoped to go down to Issyk Kul, the largest lake in Kyrgyzstan, but with the extra time we spent in Bishkek, we’re saving a couple of days by turning off towards Song Kul, via a low (ish) mountain pass. This smaller road climbed up into an wide empty valley and the grey clouds rolled in above us, starting to spit with rain. We each put a headphone in for some musical motivation to help us up the hill. We reached to top, at 2,160m, by about 1 o’clock, a good time to stop for some lunch in the shelter on the pass. It had been hard work, but we’re definitely getting the confidence (if not the fitness, yet) back. 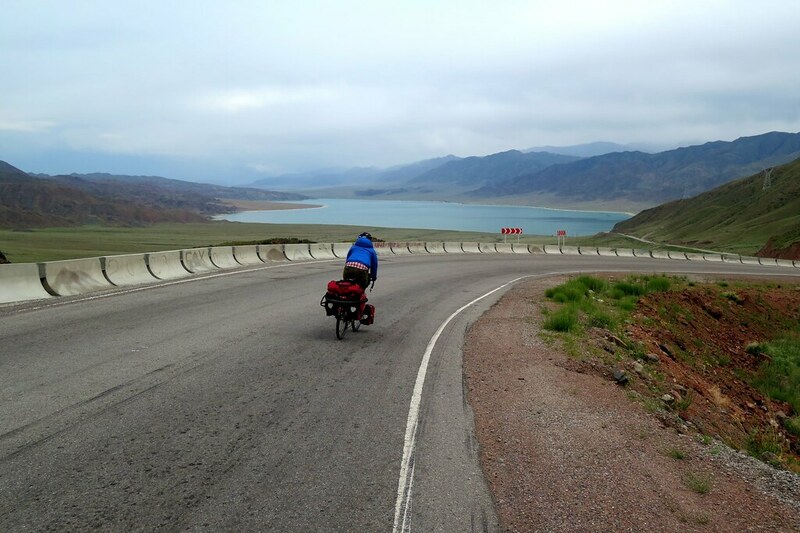 From the pass, we had an amazing downhill for the next 15km with views of Ortoy Tokoy reservoir. 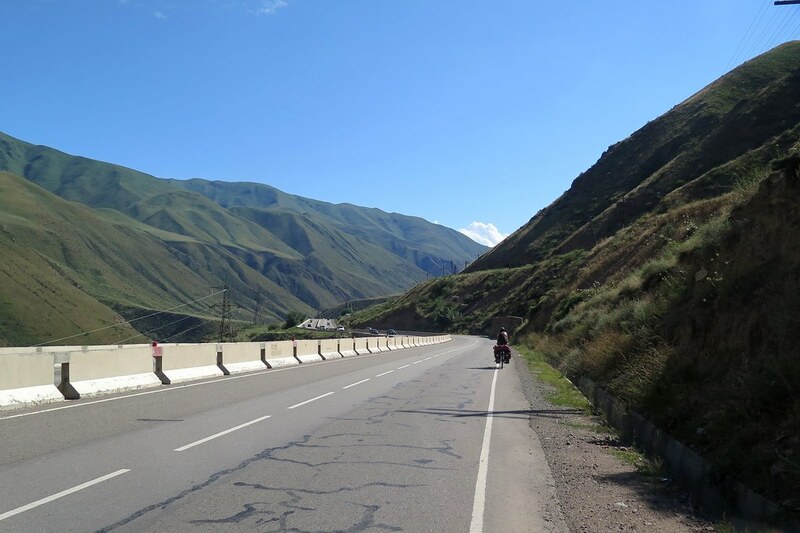 We made the most of the smooth road, which won’t last much longer, speeding down into the valley. Just after reaching the valley floor, the trip computer ticked over 12,000km. It’s been a long time since 11,000km back in China, and it’s a great feeling to be covering some distance again. 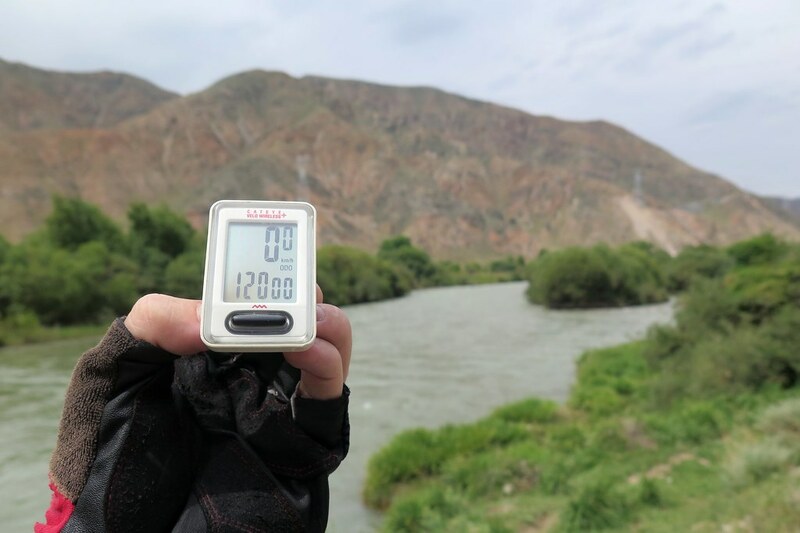 We followed a river down the valley for the last 15km of the day, into Kochkor, the last town we’ll pass for a few days. 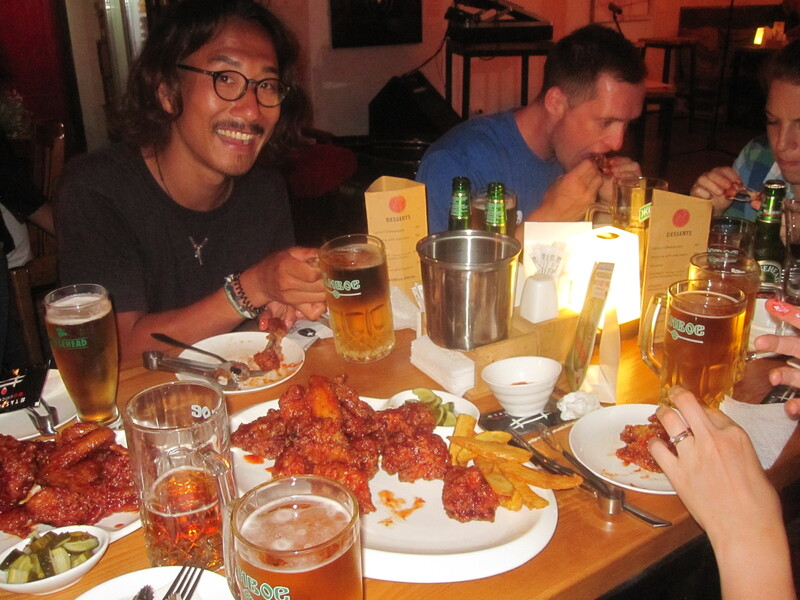 We found a little guesthouse/homestay, had a shower, then went out for a bite to eat. The menu looked extensive, but turned out the only thing available was lagman. Ok, we’ll have that then please. We got some petrol for the stove and did a bit of shopping for supplies for the next few days, the shops are basic but have the essentials. At a market stall we filled a bag with veg, and asked the price, but we were told it was free, any attempt to pay was waved away by a lovely lady who spoke great English. Just awe inspiring! Those passes certainly beat the Purbecks! 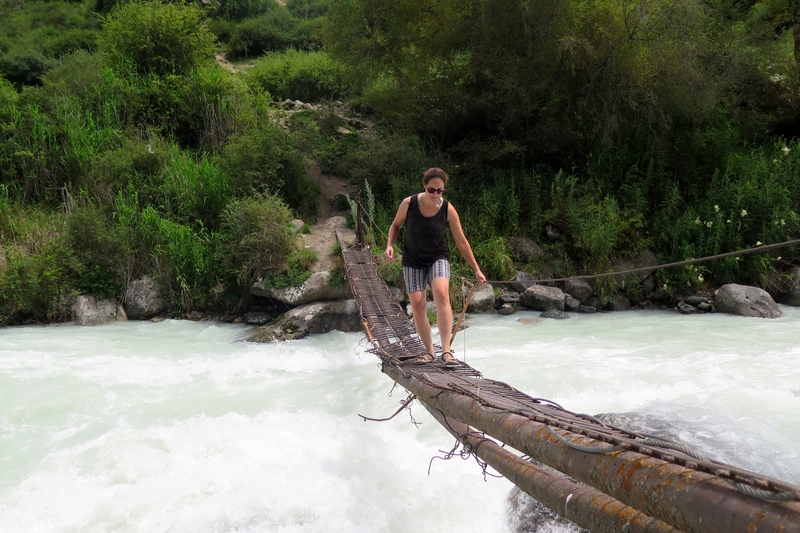 And that tree trunk river crossing….I couldn’t have made it across!